Before she was baby Bea, she was baby “B,” the name applied by doctors to the smaller of our identical twins that we learned first about in June 2017, and from the very beginning we worried about her health. Megan’s OBGYN had identified potential complications fairly early in the pregnancy, and so twice a week that summer, she and I trekked to Glen Ellyn or Downers Grove to visit the Maternal-Fetal-Medicine specialists for ultrasounds in order to closely monitor the growth of baby A and baby B. What concerned our doctors most was the disparity in amniotic fluid available to each twin. In a healthy twin pregnancy, each baby will have roughly equal space within the womb, roughly 4-6 centimeters. In our case, baby A usually measured 6-8 cm of fluid space while baby B hovered close to 2cm. If you’ve never looked at an ultrasound, they are not easy for the untrained to interpret, resembling something approximating a combination of a Rorschach test with the static of on old untuned television set. What Megan and I could manage to discern was the small amount of room baby B had to swim in – in short, it looked cramped in there. What this meant, we would later be forced to discover, is that baby B’s lungs would not be able to develop as fully as her sister. Baby A and baby B became Alexis Rose and Beatrix Reid on September 5, 2017, born via c-section three months earlier than their projected due date. They were admitted immediately to the Hinsdale Hospital NICU, and despite a busy schedule of teaching and coaching, I visited them every single day of their three and a half month stay. Alexis was sent home from the NICU on December 20th of 2017, and Beatrix joined her three days later. December 23, 2017: A big moment: Leaving the NICU for the last time. We were nine months a happy family before Bea was admitted to the ER on September 19th and was diagnosed with a virus and bacterial infections. Ultimately, those illnesses battered her (already weak) lungs and contributed to a secondary diagnosis of Acute Respiratory Distress Syndrome from which she was unable to recover. She died on October 19th. After Beatrix was admitted to the hospital, we realized we’d need to restructure our daily schedule in order to be available to be bedside, and so we made the expensive but reassuring decision to have Bea’s twin sister Alexis join her sister Clio at daycare. We’ve always loved Clio’s teachers and knew that Alexis would be in good hands there. In many ways, this decision worked very well: Clio absolutely loved being able to play her big sister role at school and insisted she take the lead when we picked both girls up from school each evening. Unfortunately, the safety and love within the walls of Kindercare did not extend beyond the entrance doors, as Megan sadly discovered. One of the first mornings that Megan dropped off both girls, she returned to her car to discover the diaper bag she’d left in the front seat was missing, and with it, all the precious contents contained therein. In the five minutes it took for her to bring in both girls, a thief had absconded with the beautiful quilted satchel, a gift from my social department to celebrate Clio’s birth, along with Megan’s computer, her wallet with all her credit and identification cards, our address book, and 20 hand written thank you notes which only needed to be stamped and addressed. The loss of the address book hurt most of all. I’d kept it since high school, and it contained addresses, phone numbers, and email contacts for every person who’d been important in my life over the past two decades. And not only that: it also contained a recently hand written list of every username and password for all the secured websites we utilized-our bank accounts, insurance, social media. A confluence of factors made this crime not only possible, but substantially more painful for us. Megan usually locked her car when entering day care, but, with so much on her mind, forgot to do so in this instance. She often did not bring her diaper bag with, but happened to have it on this day. That very morning she’d put in the thank you notes she’d written to express gratitude to all the people who brought presents for the twins on their birthday. All she needed to do was write the addresses on the envelopes, which explained why my address book was also in the diaper bag, a foreign location for the leather bound book which almost always resided in the top right hand drawer of the desk in our guest bedroom. On literally no other morning could the thief’s act have been worse. So now, with one daughter critically ill in the hospital, we were forced to expend energy cancelling our credit cards, meeting with police officers, contacting our insurance company. We were victims of actual theft, with the real possibility of being additional victims of identity theft. As it happened, whoever nabbed the diaper bag must not have looked too closely at the contents within, perhaps grabbing what loose cash was available and discarding the rest. So far as we know, none of our on-line accounts was compromised. Yet, it was Megan who later came to the sad but profound reflection that we were in fact simultaneously suffering a far more agonizingly painful identify theft: being robbed of our joy in being parents of twins and forced instead to take on a new identity of bereaved parent. After all, credit cards can be replaced, thank you notes rewritten. We can’t, though, replace our deceased daughter. And we’ll never again get to derive such happiness from pushing Alexis and Beatrix around in their double stroller, secretly pleased every time a stranger offered a cliché’d comment (which was often!) such as “you’ve really got your hands full there!” With what satisfaction did we relate to new acquaintances our story of being twins who gave birth to twins – it became a foundational part of the narrative Megan and I told about our relationship. The label of ‘parents of multiples’ was one we’d worn with pride. While the theft happened suddenly and unexpectedly, the realization that Bea was dying dawned gradually. Indeed, one of the worst parts of seeing Bea die was not initially knowing how severe her sickness was. She’d been hospitalized due to breathing difficulties twice before, but each time was released after only one day of observation. When we brought her to the hospital, we did not know it would be the last time we’d get to hold her she while she was still alert. That month of her illness was the hardest I ever endured (Read: my updates on her health during this time). In that first week, I simply expected to hear each day news of her improving from her illness, but in fact, she grew sicker. Rather than being able to wean her level of oxygen, she ended up needing even more support. At first, our doctors believed this was just the nature of the illness, that infections tended to peak after 7-10 days and that once the antibiotics kicked in, Bea would be back on the road to recovery. And there were days where it seemed Beatrix was turning a corner. We’d have moments of hope, where a sense of normalcy would slowly seem to be resurfacing, only to be faced with setback a day or two later. This cycle of fear, relief, hope, than devastation repeated itself several times – it became a trap that proved impossible to escape. How Beatrix experienced this period will always be unknown to us, though I would like to think that she experienced no pain in her month long hospital stay – that she fell into a deep sleep and eventually passed on peacefully. I am grateful that most of Bea’s extended family got to see her in the hours before her death, and that Megan and I were with her in her final moments. Of that experience, I will say little else, as I prefer it to remain private, other than to attest that I consider it one of the two sacred episodes of my life, with the other happening almost exactly one year earlier, when I was able to be present to witness Megan hold tiny Alexis and Beatrix both against her body for the first time. Megan holding Beatrix for the first time, September 9, 2017. I am so thankful, now, that I wrote at length about the pregnancy and early arrival of Alexis and Beatrix, and about their long stay at the Hinsdale Hospital NICU as they were happening, as this led to our support network widening considerably, with many, many people adopting the cause of our twins. Aside from writing about them, I shared Beatrix and Alexis’s story with the students I teach and the athletes I coach. I have never been one to adhere to a strict separation between work and home. My shared experience with Megan in raising premature twins became inspiration for stories I would tell our team. On my first day back with the Track team last year (I missed the first four weeks of the season while on paternity leave) I showed all 150 team members pictures of my twins on the day of their birth and pictures of them four months later, offering an explanation for my absence and discussing with them how integral many families of Cross Country and Track runners had been in supporting us, by bringing dinner or babysitting, while they had been in the NICU. Above left: Alexis on her second day of life. Above right: Beatrix on her fourth day of life. Bottom: Clio on her sisters on Valentines day 2014, a week before I returned to school. A year ago today Megan gave birth to our daughters Alexis and Beatrix. As I reflect upon that milestone, I am so grateful for the care and concern shared by so many with our family. As I walked down the halls this morning, I noted the ‘staff charter’ listing the adjectives HC teachers hope to feel. While I would not list ‘attending SEL professional development’ on my list of favorite activities, I can say with genuine sincerity that I do feel SUPPORTED by our school community and especially this department. Thank you for that. A favorite pictures of the girls trying ice cream for the first time on their 1st birthday. Bea would be admitted to the hospital two weeks later. You’ve all heard the expression “it takes a village” and our experience raising Alexis and Beatrix has proven to us the truth of this statement. While Megan and I have been, of course, the twins primary care givers, we owe the health of Alexis and the too-brief months of Beatrix’s health to the genuine and whole-hearted efforts of so many: to the nurses, doctors, respiratory therapists, speech therapists, and physical therapists of the NICU (and, also, the secretaries, maintenance crew, and administrators who allow the hospital to function effectively); to the tax-payer funded state of Illinois early intervention program, which provides heavily subsidized therapy for qualifying families, including any with babies born weighing under 1 Kilogram – including the amazing physical therapist and speech therapist that the girls have been fortunate to work with through that program; to the health insurance we are extremely lucky to have, which has covered literally millions of dollars of medical expense and eased, at least, the financial burden which has stricken other families facing health emergencies in America; to the friends who have babysat for us, brought us meals, lent an ear, sent words of support; and finally to the medical teams at Loyola University Medical Center and Advocate Christ Medical Center who, I know, did everything in their power to try to save Beatrix. I can at least have the peace of mind knowing that every effort was made throughout Bea’s life to provide her the best opportunity to thrive – her death was not due to neglect or cruelty – but simply to the mysteries of human biology. In every environment she lived – the Hinsdale NICU, our home, Loyola and Christ medical centers – she was loved. There is some comfort in knowing that. On this topic, I’d like to briefly comment on the difficulty of finding the right words to describe Bea’s hospital stay. Often the language of fighting was used to describe Beatrix’s battle with illness (as in describing her as a ‘fighter’), but I think this way of framing her sickness is inadequate. Fighting implies a measure of freewill, the conscious and determined effort to overcome a challenge. Perhaps it is a language suited to describe a patient who had a stroke and is trying to learn to walk again. In Beatrix’s case, she was heavily sedated for her entire hospital stay, essentially in a medically induced coma. What was happening within her body was occurring on a biological level but not a sentient one. She did not die because she “lost” a fight, but because she had the misfortune of being born with underdeveloped lungs. I prefer to think that she shone her light as brightly as she could for as long as she could. I wrote a Eulogy for Beatrix which I read at her funeral. If you were not there, I’d appreciate you taking the time to read it to gain just a bit more understanding about her life and how special she was to her family and so many others. I feel an imperative to tell her story to as many people as are willing to listen to it. I wrote there, “I know in time that when I think back on this period of our lives, what I will cherish most will be the ordinary family moments.” I wanted to take some time here to record some of my other memories of Beatrix, especially of the time after she was released from the NICU, as I know with time these will only become hazier, in the way of all memory. Since preemies are more susceptible to illness than full-term babies, we were advised to avoid taking the twins out unless necessary, so they spent most of their time in their first few months after graduating from the NICU at our Willowbrook home. To set the stage, our home, which we purchased in 2012 and have grown to love, has three floors. The basement contains our washer and dryer, storage space, and an amateurishly but lovingly built play space (recently furnished with an easel and mini trampoline). The first floor features our kitchen and living room, a room which once served as an office but now is a play room spilling over with toys, a bathroom, and a guest bedroom which has seen heavy use ever since the twins arrival. The second floor is bisected by the staircase – you walk up and directly in front of you is a bathroom where most nights around 8:00 you will find Clio taking a bath. To your left is Clio’s room which stretches the length of the house from North and South and which she’d be expected to share with her sisters once they proved capable of sleeping through the night. To the right is our bedroom, which is also rather spacious, though less so then Clio’s room due to a south facing crawl space. We have a King bed which we can lie in and see trees swaying out of the north and east facing windows. It is in this room where we built two mini cribs for the twins to sleep in at night, though by late spring they’d basically stopped using them, preferring the warm spot between mom and dad. In that early period after the twins were sent home, it was bitterly cold. On one particularly frigid day, we decided it was too chilly on the first floor for us to take the twins downstairs, so we decided to hunker down in our bedroom all day. When it was time for a meal, one of us would go downstairs to prepare it, while the other remained upstairs with Alexis and Beatrix. I recall that day feeling an odd combination of restlessness and coziness. Bea was sent home with both an oxygen tank and an apnea monitor. We had to attach two leeds to her chest, which were connected to the apnea monitor. The monitor would alert us, piercingly, if Bea’s heart rate dropped too low. Unfortunately, the monitor often rang out due to false readings (if Bea moved and the leed cord was pulled, it could trigger the alarm). There were several late night false alarms where I sprang out bed and rushed to Bea, only to find her sleeping peacefully, right through the loud alarm. It took time to figure out the best systems for managing Bea’s oxygen needs. The biggest challenge was mobility – she could only move as far away from her oxygen as her tubes would allow, which amounted to about ten feet. After a few weeks of trial and error, I discovered that by moving the location of her Oxygen compressor, I could sit in bed to feed her, which proved preferable to the chair adjacent to her crib that I’d previously used. I’d usually sit with my back to our bed’s headboard, knees bent. I would have Bea sitting so that we’d be face to face, with her leaning back against my quadriceps, a far more comfortable position. Still, it remained challenging to feed Bea, especially at night. Even getting her to finish a 2 ounce bottle was an accomplishment. Sometimes she would fall asleep while sucking, and I’d need to twist the bottle to remind her to start sucking again. January 9, 2017: On paternity leave and at home with both Alexis and Beatrix. I am holding Alexis, while Bea, with oxygen tube, rests on my lap. Each morning, we’d have to transition the twins from upstairs to our first floor. In order to do this, we had to momentarily disconnect Bea from her Oxygen, switching her from the compressor to the portable tanks so that we could carry her down. Initially, this made us extremely nervous. Eventually, we learned that Bea could be off oxygen for quite a while before feeling adverse effects, and we became comfortable enough to keep her disconnected for the minute it took to unplug the compressor, walk it downstairs, and plug it in again. Bea’s first floor perch was in a pack-n-play which we kept in a corner, nestled next to our grand book shelf and a narrow wall separating the living and dining areas. Figuring out that we could put Bea in a baby carrier and wear her around the house was a revelation. While her tube was only ten feet long, the cord for plugging in the oxygen compressor extended another ten feet, so by rolling the compressor to different parts of the room we could double Bea’s living space. We also quickly found out that both twins enjoyed being nestled against us, and it proved our most reliable method of inducing naps. I made many dinners and washed many dishes in those days with Alexis or Beatrix asleep against my chest. In those first weeks after she was discharged, Bea was assigned a home nurse who came by 2-3 times a week to check up on her progress. This nurse would bring a scale because our Doctors wanted to monitor’s Bea’s weight to make sure she was getting enough to eat. This was in the dead of winter and our front door, since replaced, was drafty, so we’d hastily undress Bea, which is substantially more difficult for a child needing supplemental oxygen (you can’t simply pull a shirt over her head) and quickly wrap her in a blanket for the short journey from crib to scale. Each time she showed weight gain, we’d cheer. The nurse also let us weigh Alexis, so we’d get a second chance for celebration if she, too, was packing on the ounces. We would bathe the twins in those days by laying towels down on the floor next to the cribs. We’d then lug a wash basin of warm water over from the bathroom and then have the twins take turns sitting in it, carefully massaging Selsun Blue (recommended to address cradle cap) into their scalps. Keeping the girls fed was a full time job in itself. Megan made a Herculean effort to continue pumping while the girls were in the NICU and thus unable to breastfeed, and we’d take this milk and freeze it to use when the girls came home. Eventually, we accumulated so much milk that we literally had to purchase an additional freezer chest, which we installed in our basement, and this too became filled to the brim. Once the twins came home, we’d take out bottles from the freezer to thaw out for use during the day. As one or the other twin wanted to eat every 2-3 hours, we’d find ourselves at day’s end with an overflowing tub of empty bottles that needed to be washed. Poor Megan had to wake during the night not only to help feed Alexis and Beatrix, but to pump. She kept this vigil until May, when, with our pediatricians blessing, she ceased production. The frozen milk lasted through July, at which point the girls transitioned to being formula fed, which led to a new set of work and expense. Complicating matters was the fact that Bea had different calorie needs than Alexis. As she weighed about one pound less, our Doctor’s recommended her formula be fortified so that she’d be getting 27-30 calories per ounce, whereas Alexis needed about 22 calories per ounce, the typical dose for preemies. So, we’d have to measure out different amounts of the formula powder into B’s bottles (2 scoops for every 3 ounces) than for Alexis (2 scoops for every 4 ounces) and then make sure we labeled the bottles so each girl got what she needed. This could occasionally be confusing, as when a bottle that we’d written an ‘A’ on with a black sharpie got washed and reused, sometimes capped with a white top with a ‘B’ on it. When one of us set out on the task of bottle washing, the other would be in charge of the three young girls, so this chore was often put off until the girls finally all went down to bed, the final obstacle between us and the precious commodity of sleep. I’d describe these days as exhausting but wonderful. I returned to school around President’s day, with the worst of winter behind us, and Bea newly free of supplemental oxygen. I find this period from late February through the end of May to be the hardest to draw memories from, perhaps because I saw the twins only a few hours of each day. I do remember the first time that Megan brought the twins to a track meet, our home McCarthy Invite held the first weekend of each May. It was a beautiful night, and despite my efforts to reserve a close parking spot for Megan, a miscommunication led her to parking in front of the high school, a quarter mile’s walk from the outdoor track. I was able to meet her and walk with Clio while she pushed the stroller trackside. I was so proud to have my whole family there to show off, despite the fact that I had to divide my focus between my roles as coach and dad. I loved, also, coming home from school in spring as temperatures began to rise and finding Megan laying on a blanket in our front yard with the twins and Clio next to her. We’d have family ‘happy hour’ which often involved a juice box for Clio, formula or milk for Alexis and Beatrix, and a beer or gin and tonic for Megan and I. It quickly became a favorite summertime ritual. Then, there was Bea’s ‘kicky legs.’ We learned from our physical therapist that Bea had a stronger back than Alexis, while Alexis had stronger abdominal muscles. As a result, Bea kicked her legs a lot more than Alexis. If she was on her back and not asleep, she would almost always be in motion. Bea also took to rolling before her twin. A few times we witnessed her roll from her front to her back. We’d cheer for her which would make her smile. By the summer, she started rolling to her side when we’d put her in her crib at night. Alexis now prefers to do the same, each roll to the side reminding us of her sister. Like Clio, Bea had moderate Plagiocephaly, which basically means she had a misshapen skull. To rectify this, she had to wear a helmet which was molded to place pressure on certain parts of her head. Bea, wearing her helmet, naps on mom’s lap on a late spring day. Her clinic was in Lombard near Yorktown mall. Since Alexis did not need a helmet, she sometimes came with, and other times stayed with one parent while the other took Bea in. Over the summer, Megan and I established a nice routine of taking Bea to her appointment and then heading to a local café for lunch. We’d sit and eat while the girls slept or played peacefully in their stroller. The café had comfortable seating areas, including a couch. I recall sitting with Bea on my lap, reading Harpers, and sipping coffee. It doesn’t get much better than that. A movie I have been thinking a lot about since Bea died is “The Descendants,” a film starring George Clooney as a father dealing with grief while also trying to raise his two daughters. The film is directed by Alexander Payne (who also directed “About Schmidt,” “Sideways,” and “Nebraska” and who depicts the messiness and beauty of familial relations as well as anyone). In the movie’s final scene, Clooney sits on a couch with one daughter on each side, watching a movie. We are left with the understanding that it is these ordinary moments, not the grandiose or dramatic ones, that make life most worthwhile. Now, at dinner, when we sit down as four instead of five, Clio will still sometimes make similar declarations. It is bittersweet when she does so. I’ve also been thinking in recent days of a political cartoon published honoring the late President George H.W. Bush. In the cartoon, he has landed his world war II era plane in heaven, had disembarked, and is being greeted by his wife Barbara and daughter Robin, who died of Leukemia at age 3. I had not previously known the Bush’s lost a child. Here was a couple who resided in the White House, saw one son grow up to do the same, and another become governor of Florida. And yet, the cartoon implied, in the final analysis what they thought about on their death bed was the daughter they never had the pleasure of raising. I am not sure if this cartoon gives me comfort or brings sadness, but it has certainly stuck with me. In some ways, life is simpler now. Raising three kids under three, including preemie twins, was so hard. I realize this even more now, knowing how exhausted I still get attending to Alexis and Clio. Alexis and Beatrix had a lot more needs than typical babies. Since her birth, we’ve never once had to take Clio to the ER. Since they were released from the NICU in late December of 2017, we had to take Beatrix to the ER four different times. Alexis, for her part, has been to the ER and/or hospital three times just in the past five weeks. Most babies are eating solids by about 6 months, which means they are fuller at night and thus can sleep for longer blocks of time. Beatrix had only begun eating purees before her fateful final trip to hospital this past September, and Alexis’s diet continues today to consist largely of formula. I haven’t had a restful night of sleep since the twins came home from the NICU. Towards their first birthday, each twin would typically wake twice, on good nights, for a feeding. When one or both were congested or had a cough, they sometimes awoke hourly or remained awake and fussy for long stretches of time, occasionally requiring a fifteen minute Nebulizer treatment before they could fall asleep again. And then I’d be up at 6:00 am for work, and Megan would be left to manage all three girls. I’d teach all day, then head to practice, and return 11 or 12 hours later, exhausted but knowing there’d be no chance for rest. The challenges of parenthood are most certainly not evenly distributed. But here is the thing: raising two kids is expensive and exhausting, but it is less expensive and less exhausting than raising three kids. I would give anything to have back that extra exhaustion and expense. I recall a conversation I had with a colleague when Megan was pregnant with the twins and we knew of the potential for complications where I told him, “I’m rooting hard for the least financially secure future.” Even then, I understood, the sense of purpose in raising children was a far worthier goal for me than the accumulation of wealth. It is natural after one has endured tragedy to reassess ones’ priorities and to reflect upon the choices one has made. In the aftermath of Bea’s funeral, I have thought a lot about how I have devoted my time, what I have valued, and how Bea’s death will change me and the lives of my family members. One question I’ve considered is whether to continue coaching. Should I be spending every extra moment I can with my wife and daughters, knowing how precious life is, how short it can sometimes be? Here, the conclusion was not difficult to arrive at: yes, I should continue to coach. What Bea’s visitation and funeral laid bare was just how wide our family’s network of support was. By sharing my time between my own kids and the kids I coached, I believe all were enriched. I think back now on my life much differently than I did just two years ago. I realize now that I skated through life for my first thirty five years. At age 35, I’d accomplished most of what I’d wanted for myself. Between 2010 and 2015 I’d gotten married, purchased a home, finished graduate school, paid off the last of my student loans, achieved a major life goal of being part of a state championship cross country team (then did it again), was named head track coach, and became a father. I loved my job and was in excellent physical shape (during that time frame I had a streak of running 964 days in a row, with each run being at least 4 miles but averaging closer to 8). The one major stress of that period was a long delay in beginning the family we always dreamed of: it took three years and eventually an in-vitro fertilization procedure before Megan became pregnant, but on November 19 of 2015, Clio was born, and life seemed just about perfect. A game Megan and I have played throughout our relationship is to ask: what would 18 year old Noah think of 30 year old Noah? What would 22 year old Megan think of 35 year old Megan? We always could answer smilingly that our younger selves would have been thrilled to look into the crystal ball to see where we’d ended up. It has been said often by those who endured the pain of losing a loved one: it is better to love and lose than to never have loved at all. What would happen if 18 year old Noah were given a choice: here is your life at 38. You’ll have most of what you want, but your wife will give birth to premature twins, who you will both come to love fiercely, and then you will become a helpless observer as your dear Beatrix dies after a month of hospitalization. Or, you could pick the life behind door number 2? Without hesitation, I choose the first option. Which is to say, 18 year old Noah would still accept what life had in store for the next twenty years, would be grateful, but also sad. Throughout Beatrix’s illness, I was on the phone often with my friend Alison, a Doctor working in the PICU at University of California San Francisco. Since she worked in the area of pediatric critical care, she became an invaluable resource, Bea’s strongest advocate, and a huge source of emotional support. We’d first met in college as we both ran on the cross country team, and became housemates with a couple other teammates during junior and senior year. I remember a conversation I had with her back in those days where we were discussing what we wanted out of life. I said I hoped to be happy, and was surprised to hear her say she did not necessarily agree. I understand her perspective better now. Happiness is an emotion that is enjoyable to experience, but it must find you, not you it. What is more valuable is to love and be loved, with all the pain and worry that invariably involves. This is why a particular Raymond Carver poem seemed the most appropriate for Bea’s death announcement. Carver wrote And did you get what/You wanted from this life, even so?/I did. And what did you want?/To call myself beloved, to feel/beloved on the earth. He wrote this as an old man in the twilight of his life, but does it not apply to all of us, regardless of age? Bea will never get the chance to go to school, to grow old – but she was loved – oh, was she loved! – and in this, her life achieved perfection. In my nearly 25 years of competing and coaching, I’ve experienced my share of both triumph and despair, but three moments in particular stand out as being particularly agonizing. All three involved falls. In 1997, during the state cross country championships of my senior year of high school, my twin brother collapsed short of the finish line, his body succumbing to hypoglycemia. He ultimately managed to crawl on his hand and knees the rest of the way, but ended third from last. The final results showed us a single point behind Lockport Township for the state title, which would have been Mr. Newton’s twentieth. In 2011, during the state cross country meet, a sort of déjà vu occurred, as our lead runner Jack Feldman’s legs gave out on him at almost the exact same spot on the course as they had for my brother 14 years earlier. His dreams of all-state collapsed when his body did, and with it our hopes of a top-eight finish, which at that point had been a major goal for our team. (The one time we qualified for Nike Nationals, our top runner Billy Magnesen took a fall 800 meters into the race and was unable to get back up, which caused us to finish dead last in the team standing. However, the burn of that race was significantly mitigated due to the fact that we were still coming off the high of having won our programs first ever state championship a few weeks earlier). The third moment came this past weekend, during the state finals of the 4*800. We’d run a smartly executed race in prelims to set ourselves up well for the final, having run a measured 7:52.09, a season’s best for us up to that point. We had a veteran group of athletes who’d been steady all-season. Some guys you coach are up and down – you’re never sure they’ll be ready on race day. I never worried about that with this group. I was confident that they’d run smart and would not be rattled by the pressure of running in state finals. The year before, we’d dropped 4 seconds off our time between prelims and finals, and I knew that we could do it again. If so, we’d have a school record and definitely be in the hunt for a top 3 finish. Anything better than 7th would be the top finish for our team since Coach Westphal and I started coaching back in 2005 (only the 1997 and 1998 teams have done better). After careful deliberation, we had chosen Colin Yandel to run lead for us. This was to be the culminating race of an astonishing senior year, one marked by stratospheric improvement. In Cross Country, as we are now fond of saying, he went from “16th in JV Conference as a junior to 16th in state as a senior.” He carried on this improvement in Track and Field, running PRs of 4:18 and 9:21 outdoors. Despite having a legitimate chance to earn all-state in the 3200, he’d selflessly decided to run the 4*800, choosing to help his teammates rather than seek individual glory. Almost comically, he had finished his junior year of Track having run 2:20.6 in our JV conference track meet. Guys like that don’t run in the 4*800 state finals. Yet, 51 weeks later, he was clocking 1:58.0 at Sectionals, and his body, now Kenyan-like with long skinny legs and short waist, was ready to carry him even faster. He’d been unflappable on meet day all season long, and we knew he’d position us well. The gun was fired and the race began with the normal jockeying for position. The pack was tight through the first lap, with all 12 athletes coming through the 400 within a second of each other. Colin was right in the middle, and I worried about him being boxed in. The pack came through lap one with all 12 teams together, in roughly 57 seconds. Three freeze frames showing the moments right before, during, and after Colin’s fall. It’s impossible to know exactly what happened, but the end result was the shattering of a season long goal held by Colin, Alec, Neil, and Sean. When you get knocked down, the best of us get right back up. Colin, acting on instinct, rose shakily to his feet, retrieved the baton which had rolled away after his face plant, and gamely hobbled towards the finish line. By the time he passed off to Alec Hill, we were 75 meters behind everyone, an impossible gap to make up in a race like this. Alec, Neil, and Sean did the best they could, but the air had been let out of the balloon. The Track Gods would go on to claim two more victims in this race, with a Danville runner going down around the same spot as Colin did a lap later, and a Metea runner having to step off the Track on the final leg due to massive leg cramping. We ended 10th place, one spot away from all-state. Here is the foursome after the race. Notice the blue Track residue on Colin’s jersey. He has been instructed not to wash his singlet, but rather to bring it with him to college and to pin it to the door of his dorm room, as both reminder and motivator. What hurt the most was that this was a group who did everything right. They worked hard, listened to their coaches, displayed no arrogance, and had fostered an inclusive and welcoming team atmosphere. They’d all bought into the concept of team, choosing to scratch their individual events in order to give our relay the best possible chance of doing well (Neil Cumberland had qualified in the 800 with the 9th best seed time, and Yandel and O’Connell had both qualified in the 1600, with Colin seeded 9th and Sean 15th). And they were rounding into shape at the right time. Neil ran a 2-second PR at Conference to drop his 800 best to 1:57.5, then dropped again down to 1:56.2 at Sectionals, repeating that performance in Prelims. Sean O’Connell had run 1:57.5 in both Conference and Sectionals before throwing down a 1:55.9 in Prelims. And “little” Alec Hill had become a consistent sub-2 guy, running a PR of 1:59.5 in Sectionals and repeating the effort in prelims. Added together, their PRs equated to a sub 7:50, so we knew that if we simply ran what we were capable of, we’d be in the mix. As it turned out, a sub-7:50 would have been good enough for third. I’d also note that by qualifying for state in the event, we joined Sandburg and Neuqua Valley as the only schools to earn a birth to state in the 4*8 for 8 years straight. Not coincidentally, those two programs have finished top 2 in this event each of the past two years. True. But, there is one other thing I can do. I can tell the story of their race. 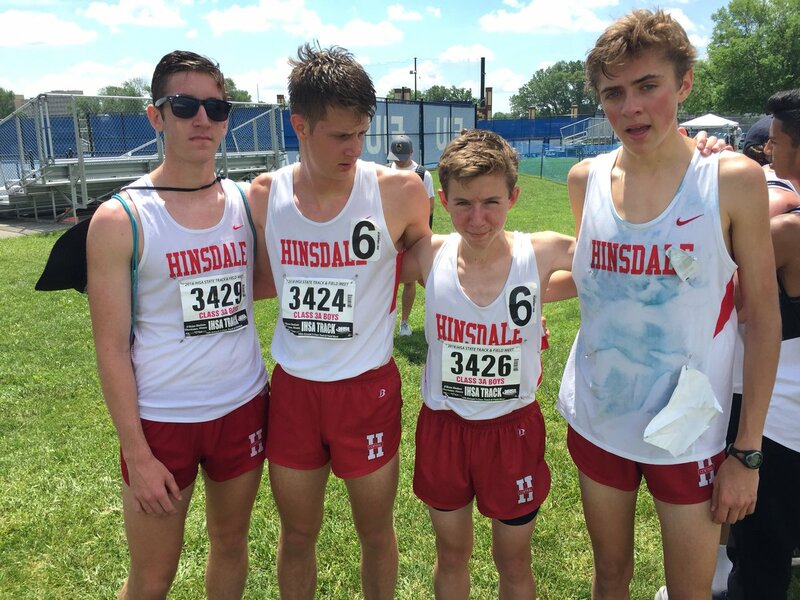 I can give context to the results, so when people read “Hinsdale Central – 10th – 8:08” they will understand what it means. I can tell everyone that Sean ranks 4th in the “Westphal/Lawrence era” for the 800 and 3200 runs, and 7th in 1600 and is as focused a competitor as I’ve ever coached. That Colin Yandel ranks 6th in the 1600 and 5th in the 3200 and underwent shocking improvement in his time with us. That Neil Cumberland ranks as our 8th best miler and 6th best half miler, and after three years of struggling with being ready on race day put together a beautiful senior year where he came through in every single high pressure situation. That Alec Hill is the most even-tempered and mature junior I’ve ever coached. It seems crazy to me that Sean O’Connell and Neil Cumberland will graduate without any state medals. They led the team to a surprise fourth place finish in XC, one place out of the medals, and finished 10th in the state 4*8, once again one place out of the medals. However, I take solace in the fact that the two HC athletes ever to earn All-American status in college, Neil Pedersen and Nathan Hill, were never all-state in high school. Nathan Hill, older brother of Alec, also raced on Saturday. His race was the antidote to ours. As a senior in high school, Nathan had a disappointing state Track meet, failing to advance beyond the prelims in both the 4*800 and open 800, despite a PR of 1:55. Yet, two years later he was waiting for us when we arrived back in Hinsdale, having just finished third in the nation at Division 3 Nationals in the 800, with a time under 1:51. Nathan, incidentally, has fallen in races more than any athlete I’ve ever coached. But his story reminds us that, no matter the disappointments of high school, new promises await for those who choose to keep competing. I, too, know from experience that nothing motivates quite like disappointment, that out of the embers of this stillborn 4*800 will be constituted successes yet unimaginable. A stinging 1-point loss at the 1997 state meet led me towards a career of teaching and coaching, and filled me with a desire to motivate others the way my coach had motivated me. The pain I felt after watching Jack Feldman’s fall in 2011 spurred me to go on a quest to meet with as many great coaches as would agree to see me (Chris Quick, Paul Vandersteen, Charlie Kern, Jason Crowe) to learn about the shared habits of top quality programs. I credit both low points for setting me on the long path towards a state championship, which, when achieved, was all the sweeter owing to the knowledge of all that came before it. So, to Colin, Neil, and Sean – and to the teams at Danville and Metea Valley and Downers Grove North (who would have been 4*800 favorites if not for an untimely injury to their top middle distance runner Brendan Lockerby) – be proud of what you accomplished, know that you were trailblazers, and use the pain of this moment to inspire you to achieve whatever goals you set next. How do you measure the worth of a man’s life? If it is by the number of other people whose lives that man has touched personally, and in a positive way, a strong argument can be made that few people will ever match the impact made by my high school coach, Mr. Newton (he’d never accept any other form of address from his athletes) who passed away yesterday at the age of 88. His genius was in forcing people to do what they did not think they were capable of, by setting extremely high expectations and stubbornly refusing to waver from them. He did this for, I am sure, tens of thousands of individuals. And this accounts for only those he coached directly. It does not include fellow coaches who learned from coaching against him, from reading his books, from hearing him speak at clinics. It does not include all the athletes who were coached by a York alum, or by a Coach who studied York’s program in order to improve their own. My own story is simultaneously unique to me and the most quintessential of all cross country personal narratives: I entered high school desperately wanting to be recognized for being good at something in the realm of athletics, since, at under 5 feet and less than 90 pounds, I’d yet to make any team that had cuts and was routinely last picked for the pickup basketball and playground football games. I wasn’t a great middle school cross country or track athlete either (working my way up to 7th man on my 8th grade team and finishing middle school with PRs of 2:40 and 6:06 – yes, I still remember). Most of the six guys in front of me (all except my twin brother) left running to pursue more glorious sports at high school (to bust another misconception, even at York, Cross Country did not offer status even close to the same level of the traditional glory sports of football and soccer). I joined the summer running program before my freshmen season, and that made a big difference. I found myself as the #4 freshmen on the team, getting to represent the frosh squad in a few of the invites we attended that had a freshmen level. And our team would win! Having a taste of that success during the insecure first months of high school was enough to convince me that the pain of workouts and the grogginess of early mornings was worth it. Still, after my first XC season, I nearly was convinced by a very persuasive wresting coach to try out for that sport in the winter (they needed someone for the 100 and under division who would win half the time by disqualification since many schools couldn’t fill that role). As my Hinsdale guys know (I’ve told the story lots) what prevented me from doing so was fear of Mr. Newton. I went into his office to tell him of my intended plans, but before I could say anything he looked at me and said, “Twin – 45 minute run today.” And I said, “uh…OK, thanks, Mr. Newton” and left his office with the dawning realization that I’d just resigned myself to 3 and a half more years of that tough, tough sport of distance running. By then, some of the upperclassmen on the team started to adopt me, and the newfound popularity of getting invited to hang out with older teammates was another factor motivating me to stick with it. My sophomore year, a foreign exchange student from Norway named Marius Bakken came to attend York and run with our team. He lived with a family whose home was 3 blocks from mine and which I passed each day on the walk to school, so my brother and I got the unique privilege of walking home from practice most days with a guy who went on to become one of the greatest distance runners in York, Illinois, and Norwegian history. My own confidence grew. I remember how proud I felt when I first made the top 12 sophomore year and was issued a “York top 12” shirt –I could not wait to go to school the next day and walk around the halls showing it off. Mr. Newton very carefully designed a system which promoted competition within the ranks. The top 7 guys were anointed ‘group 1’ and given matching shirts. The next 7 guys were group 2 and had a different shirt, while #15-21 were called ‘the emerging 7’ and got yet another shirt. If you missed a practice or bombed a meet, you had to give up your shirt to the guy who was replacing you. There were also the ‘1000 mile club’ turtlenecks given to guys who could show documentation of having run the full millennium between the start of summer running and labor day, along with the even more prestigious 2000 and 3000 mile versions (for doing it again junior and senior year). For the parents reading this, I think it is important to acknowledge this, too: Mr. Newton’s rules were ironclad. Most parents of his runners were not thrilled with the sacrifices he demanded of his athletes. York runners did not go on spring break. Practice was mandatory, at 7:00 am every day of break except Sunday. College visits were not excused absences. I remember how frustrated my parents were when Mr. Newton informed them that he would not permit us to miss both a Friday and a Saturday to visit a college – doing so would constitute two unexcused absences and result in removal from the team, no matter that this was two of his top seven athletes. He could also be incredibly harsh in dressing down athletes, sometimes in front of their peers. If you let the team down, he was going to let you hear about it, and often in front of the whole team such that we’d all draw the lesson. I share this not as criticism but in an attempt to capture Mr. Newton in all his complexity, and to remind us all that to have a remarkable record like York many difficult choices had to be made. No, you could not leave practice early for a band concert. Decide which of the two was more important to you. You’d better not be late. The only excuse was if you were stopped by the train, which Mr. Newton claimed he would verify. You got one tardy. On the second, you were out. Heading to the starting line of the 1997 Illinois State Cross Country meet. I am sure that I’d never felt a greater sense of purpose up to that point in my life. Like most York guys, though, time and experience has allowed me to more deeply appreciate what a true gift it was to be able to run for Mr. Newton. 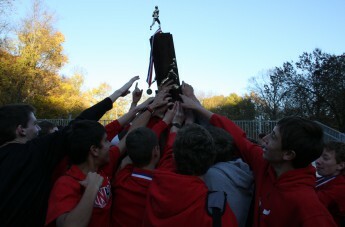 The payoff could be quite tangible – I’m pretty sure having ‘Captain-York Cross Country’ on my resume got me my interview at Hinsdale Central – but more significant has been the sense of self Mr. Newton helped me and so many others cultivate. He would often promote “commitment to excellence” as a guiding virtue, and would encourage us never to settle for average in any endeavor we’d go on to pursue. He helped me develop a work ethic and a belief in my own abilities that helped me get to where I am today –a high school teacher and cross country/track coach, the surest evidence of all of how significant Mr. Newton has been to my life. This would prove to be the last time I ever talked with Mr. Newton. I am so grateful the moment was documented. I told him how grateful I was to him and how I hoped to help carry on his legacy. He patted me on the back and told me he was sure I would. I am proud and honored to take on that responsibility. Like a well rowed boat, these 2017 varsity team was steady all year: 2nd at Hornet- Red, 2nd at First to the Finish, 3rd at Palatine, 4th at Twilight, 3rd at Conference, 3rd at Sectionals. We entered the week of state with the goal of running the best we were capable of on the day. We knew we could not control how anyone else did. We also knew, though, that a top three finish, while unlikely, was at least within the realm of possibility. We decided to look at that prospect as an awesome opportunity, one not often afforded. Come what may, we wanted to know that on the day we met the challenge in front of us, did not cow in fear. A few seconds ahead of Sean was our other returning state runner, Sean O’Connell. I worried about Sean given that he’d come down with a cold mid-week. He stayed inside on Thursday while the rest of the team ran their workout, started taking cold medication, and even packed a humidifier to keep in his hotel room on Friday night. Sean ran smart, not getting out too fast, and moved up nicely in the second half of the race. I can say with certainty that no athlete on our team worked harder in the 365 days since last state meet. While his overall individual place today was, I know, not what he’d hoped for, our team place was. And in the end, that is what we’ll remember the most. Sean did his part by being a quite humble leader. He worked hard and inspired others to do the same. That will be his lasting legacy. Something similar can be said about Sam Schiavitti. Sam was our 7th man today. Late season illness and a nagging injury prevented him from having the state race he wanted. But, he, like Sean, worked tremendously hard to get to this point. If Sean ran the highest mileage of anyone in our top 7, Sam was definitely in second place. He is probably the most gregarious member of what has to be the most quiet and serious varsity group we’ve had in a long while. When I told the team about my twins back in September, it was he who came, on behalf of his teammates, to tell me they were thinking about me. When the race was over and we were packing up, it was Sam who stayed behind to make sure all water bottles were thrown away and that everyone had grabbed all their belongings. The point here is that you can contribute to your team in a lot of ways, and Sam certainly enriched ours. Our juniors, too, were steady as could be today. Alec Hill finished 37th, pretty darn good considering he’d been 18th in conference just three weeks previous. As they say about Rudy, the famed former Notre Dame kicker, Alec is “five foot nothing, a hundred and nothing.” Actually, less than 100. He might be the smallest guy out there, but what a heart. Alec broke 15:00 for the first time today and will be an unequivocal leader in the year ahead. As will Matt Kusak, our hyper-focused fourth man. Matt, too, struggled this season finding competitive fire for the finals stages of his race. The transition from sophomore year to junior year is a tough one, as an athlete used to being at the front of most races usually finds themselves junior year in the uncomfortable middle. Matt ran fairly well throughout the season, though had some races where he underperformed. He used each subpar race as a learning experience, adjusting his strategy based on his previous performance. By Regionals, he’d begun to gain his confidence back. As we approached state, I knew he was ready to run well. He finished 54th today and has a new PR to show for it. He’ll join Alec as the beating heart’s core of next year’s team. As a junior at state in 2012, TJ Caveney ran 15:33 and finished 126th. As a junior at state in 2017, younger brother Keegan ran 15:33 and finished 121st. Those who know our team’s history know how TJs senior year finished out. As mentioned earlier, TJ wrote in his advice to the team about the importance of getting out fast. Of all our runners, Keegan least adhered to this advice. When I saw him after rounding the first turn, he must have been in 200th place. From there, though, he moved up nicely and earned a big PR on an even bigger stage. Keegan joined us as a sophomore after playing soccer freshmen year, and it is fair to say that decision has and will continue to pay huge dividends! And what can I say about Colin Yandel? I’ve never had an athlete improve as much in a single season as he has. He entered the season with personal best of 2:15 in the 800, 4:45 in the 1600, and 10:03 in the 3200. He finished 16th in JV conference as a junior and was the 12th man on our roster of 12 travelling down state. Colin Yandel was 16th in JV Conference as a junior and 16th in state as a senior! His form is gangly, he has long legs and no waist, and he was the last guy of our returning top 12 we ever expected to be leading us this season. But lead he did. And it was not accidental. As he began to understand himself as an elite runner, his habits changed to match the new identity: keeping his distance from coughing teammates, packing his own healthy lunch to eat on our trip down. Colin joins the likes of TJ Caveney, Griffin Gartner, and Josh Feldman as guys who rose up in ways no one anticipated. I will tell his story for the rest of my coaching career. The moral is this: you just don’t know when all your hard work will pay off. You can put in countless miles and hard workouts and see very little payoff, but as long as you keep faith and don’t give into the frustration, the possibility remains of a breakthrough. I promise you Colin Yandel never even dared to believe he could be all-state even as late as the Hornet-Red invite this year. We stand in disbelief at his accomplishment. This is, by far, the most liked Tweet I’ve ever posted. To our alternates – Piyush Mekla, Fletcher Spillers, Bradley Davis, Anshul Sankaran, and Will Ricker, you guys played your roles beautifully. You observed, you learned, you protected our troops, and you gained inspiration that will fuel you in the years ahead. Congratulations on a well-earned experience. You are charged now to use it for the betterment of yourselves and teammates. We had tremendous support from our larger team. Jack Borys and Alex Treankler came through in the clutch to shepherd a crew of guys down state. This crew (plus others) included John Wheeler, Brandon Belgrad, Charlie Carter, Liam ‘Ro’-Bots, Nathan Saltzman, Andy Munoz, Tom Kusak, Aaron Lu, Patrick Hsiao, Mac Anderson, Liam Walsh, and Joe Glasby. If I could figure out how to do it, I’d mandate every guy on our team to come down state. How could you not leave inspired? Illinois’s state XC championship is second to none. I know the guys who came will not for a moment regret the five hours in the car. Thanks, you guys, for your support. You share in this outcome 100%. ILXCTF pre-season rankings had us ranked 14th. No team improved upon their pre-season ranking more than we did! Milesplit and ITCCCA had us a little better in 7th and 9th. I would have put us 8-10. It was the first year in a half decade where earning a trophy was not an explicit goal of ours. I knew we were not in the league of DGN, and that other teams had much more returning firepower than us. In the days leading to state, I was asked often what my hopes for our team were. My reply: 7th place would meet expectations. Worse than 7th I’d be disappointed. Better than 7th would exceed expectations. So, there you have it. The guys stepped up when it mattered, fought as hard as they could. We didn’t trophy, but we got damn close. We finished as the third best HCXC team in history, with only the 2013 and 2014 state champion teams doing better. I am as proud of this team as I was of those. I was thrilled when I saw the results of the girls 3A state meet and noticed the LT Girls finished third and earned a trophy. It may seem odd to hear a Hinsdale Central coach revel in a rival’s success (I was equally happy to see Grace McCabe and McKenna Revord earn all-state) but in this case I was really happy for the aptly named head Coach of the LT Girls, Alex Lyons. I first got to know Alex when he student taught at Hinsdale Central. He sought me out to ask some questions about coaching, and I quickly came to appreciate his passion for the sport, keen intellect, and stoic demeanor. He has proved a quick study, leading his team to fifth place as a rookie coach and to a trophy in just his second year. He is the guy I have run more with on Sunday more than anyone else this season (DGN state champion coach John Sipple ranks a close second) so I’ve learned of his teams’ ups and downs basically in real time. I know his girls finished 9th place at First to the Finish in the second week of September, and that Alex had the patience and faith even then to believe they’d improve by state. Coach Lyons has the wisdom and maturity of someone twice his age, but he may be the youngest head coach in 3A. That should be a scary thought for coaches of girls’ teams statewide. As we drove our minibus up the crowded road towards our team area, I looked out the window to see Sandburg’s head coach John O’Malley walking across the field, carrying a gift bag with pink tissue paper peaking out of it. I found that to be curious. I was amazed and virtually speechless when, a little while later, after I’d exited the bus and was standing outside our team area, John came up to give the bag to me. It was a gift for my twin girls (who turned two months old today) along with a card from his family. What a truly class act. For those wondering why Sandburg has established such a strong tradition, that act of kindness goes a long way towards explaining it. Story two – It is the night of the 2015 McCarthy Invitational, our annual home track meet. The meet has ended, but we had planned to seize upon the opportunity of having access to the Track at night to hold a 3200 time trial for all our JV guys who did not make the invitational lineup. The time trial began just as the last of the competing teams were leaving the track. Coach Sipple and Buhot of DGN, realizing what is going on, turn around and return to the track. They stay and cheer for our JV guys. Story three – It is this past Monday. Coach Sipple comes to my house at 8:30 pm to babysit for our daughter Clio so that Megan and I can go to the hospital to visit our twin daughters Alexis and Beatrix. It is the five days before state and John is the head coach of the top rated team, yet he volunteers to come babysit for the coach of an opposing team. Pretty obvious moral here – act with class, make sure you have strong values and that you live up to them, and the results will eventually take care of themselves. Neuqua Valley is equally as good an example of this. We tip our hat to you, DGN. Congratulations on representing our conference so well (and to Lyons Township, York, and Glenbard West as well). Keep it rolling through the post-season. So wraps up the 2017 season, definitely the most personally challenging of my life. But here it is November 5th, and the season ended pretty close to as well as I’d hoped, my twins are stable and healthier each day (now 3 pounds 5 ounces and 3 pounds 13 ounces), and I’ve never felt so fortunate. Prescript: This blog is not about Cross Country, at least not directly, but it is about my life and as such Coaching and Running are interwoven throughout the narrative. I am hopeful that (among others) many of my current and former athletes and their families will read this. A team value we’ve always upheld is that through challenge and tribulation comes a sense of purpose, even in situations where the outcome was not what we’d hoped. The past few months of my life have put that premise to the ultimate test. While the experiences I’ve had are unique to my family, I hope my reflections on those experiences contain some insights others may find valuable. At 19 weeks, we thought we lost them. On Saturday, July 22nd, I returned home from a run with my friend and coaching colleague John Sipple to discover the car of Sarah McCabe, wife of Girl’s Cross Country coach Mark, sitting in our driveway. This seemed odd. Though, Sarah had recently babysat for us (the McCabe’s live a short five minutes away) I had not expected to see her visiting on a sunny weekend morning. I paced up our walkway wondering what brought her to our place and was met at the door by my wife Megan, who told me in a calm and steady voice: “Sarah is here to babysit Clio. We need to go to the hospital. I think my water broke.” My heart dropped. We were still weeks away from viability. At the hospital, we were ushered into a delivery room, and the Doctors ordered some tests to determine our status. The wait for those results were among the worst moments I can ever remember feeling. When the Doctor came in to report that the test came back negative, relief washed over us and I came to a new realization: the only thing better than learning of good news is learning of the absence of bad news. Nonetheless, that day will forever be etched into my memory as the day I learned what it must feel like to be met with unexpected tragic news. Two days later, we visited our Maternal-Fetal-Medicine specialist for one of the twice weekly ultrasounds they had recommended for us, given the complications we’d experienced from early on in the pregnancy. These regular checks were intended to pick up possible early signs of Twin-to-Twin Transfusion syndrome, a disease impacting about 10-15% of identical twin pregnancies, wherein blood from one twin is shunted to the other. The best known treatment for TTTS is laser ablation surgery, where the blood vessels are separated so as to stop the transfer from happening. This was the appointment where signs looked ominous enough for our Doctor to recommend we travel to Houston for consultation with specialists followed possibly by surgery. The next day, I attended summer running, and gave a speech to the team. The juniors and seniors would be leaving the next day for our annual team-building trip in Kenosha, and for the first time ever, I would not be able to join them. I told a story about my first coaching job in Lamoni, Iowa, a tiny rural farm town with a high school student body of just over 100. I took over a Track team that had not won a conference title in 30 years. My first year, we finished 5th. My second year, we finished 2nd, less than ten points behind the winner. That second year, the team started experiencing success they’d never had before. We won a meet for the first time. It was a few days after that first victory that I had to let the guys know I would not be returning to Lamoni the following year as I’d been accepted to Graduate school at University of Iowa. My message to them was simple: you now know what you are capable of, and you will be successful without me. Sure enough, the next year they won the conference title by over 50 points. The next day, the Cross Country team traveled north, while Megan and I flew in the opposite direction. A month before the city faced the deluge from Hurricane Harvey, we arrived in Houston and met with Doctors from the Children’s Hospital. But, they opted not to perform the surgery. The disease had not progressed far enough to warrant an invasive surgical procedure. It seemed we dodged another bullet. The surgery would remain an option up until 26 weeks, after which time if signs of TTTS reappeared the only option would be to deliver the babies, as the surgery carries too great a risk in the third trimester. Summer break ended, school started. I was no longer able to attend each and every ultrasound appointment, owing to work obligations. However, I requested a half day to be with Megan for our 26-week appointment on September 1st, since we’d be getting an update on the growth of the twins (these are scheduled for every two weeks). Though we’d come to expect the unexpected, we were once again thrown off balance by learning that the TTTS was beginning to reverse, with the twin that had previously been receiving blood now in the donor role. Our Doctor told us this could mean delivery could happen soon – perhaps within a few weeks – and ordered Megan to get steroid shots to prepare for that eventuality (the steroids help aid lung development of the babies). So, on Saturday September 3rd I cheered on the Red Devils at our home Cross Country invite in the morning and then went off to Hinsdale Hospital later that afternoon to accompany Megan while she got her first of two shots, the other coming 24 hours later. We spent a relatively relaxed labor day enjoying beautiful weather and the company of my brother, sister-in-law and niece. The following day, Tuesday, September 5th, began as an ordinary day. I went to school, taught my classes, headed off to practice. I knew Megan had a 3:30 appointment with the Doctor for an ultrasound, and that more than the upcoming dual meet against Glenbard West occupied the majority of my thoughts during the run. Upon returning back to campus after a six-mile loop, I took a detour down to the locker room to check my phone before rejoining the team in the weight room. Megan had left a voicemail. The words echo still: “The Doctor says it’s time.” Adrenaline and fear rushed through my body. We knew prematurity was a possibility, but only a week earlier things had seemed to be leveling out, and the hope of making it past 30 weeks seemed not just possible but likely. In the third trimester, every single day matters, and this was way earlier than we wanted. It meant our girls would face longer odds. At that moment, I was terrified of what could happen just during the delivery itself. I found Coach Westphal and relayed the news, told him I’d be out for a while and would update him when I could. Rushed home. Packed a bag. Headed back to the hospital. I met Megan and she told me surgery was scheduled for 7:00pm, as soon as the second neonatologist arrived. Megan’s sister Liz was with her, as was our daughter Clio, who, though unable to understand exactly what was happening nonetheless sensed a great change was taking place. Yesterday was a momentous day in our lives. Alexis Rose Lawrence was born at 7:42pm weighing 1 pound 6 ounces. Beatrix Reid was born one minute later weighing 1 pound 10 ounces. Their birth came earlier than we had hoped (26 weeks, 4 days), but based on our Doctor’s advice, this was the best possible course of action. These precious girls are tiny and, as with all preemies, there are a lot of risks and challenges ahead, but so far the Doctors seem pleased with their progress. We have been told to expect ups and downs, and we know we have a long road ahead. The beautiful irony in all of this is that yesterday Megan and Liz got the results back from the DNA test they recently took to find out, finally, if they were fraternal (as they’d always thought) or identical, and the results showed a 99.9% chance they are identical. So on the day Megan learned she was an identical twin (as, most of you know, am I) she gave birth to identical twins. Please keep Alexis and Beatrix in your thoughts and prayers as they adjust to life outside of the womb. Megan and I spent four days in the hospital as she recovered from her c-section, and in that period we made the journey down the hallway from the maternity ward to the Neonatal Intensive Care Unit (NICU) roughly a dozen times. It began to sink in how radically and irrevocably our lives had just changed, both in the short term and long. Both babies had safely been delivered, so that hurdle had been cleared, but a new set of worries now lay before us: would our girls be OK? To see them is to understand how incredibly tiny they are – the smallest living humans I have ever seen in my life. To envision them as even the size of Clio when she was born – 5 pound, 14 ounces – is hard to conceive at this moment. In addition to worrying about Alexis and Beatrix’s health, we had also to consider our own. Megan would be recovering from surgery, must get up every three hours to pump, and faces the challenge of spending time with the twins while also caring for Clio. I would need to find the strength to balance my work as a teacher and coach with my commitments to caring for Megan and Clio along with making daily visits to the NICU and striving to get enough rest to sustain that schedule for months. I make no claims of exhibiting courage. You deal with a trial like this the way you deal with being thrown off a cliff. I am still afraid to even touch our babies, fearing I’ll accidentally knock a tube or IV (Megan is doing much better, already helping out with changing diapers, taking temperatures, and holding Alexis and Beatrix). Coming back to work in some ways feels like the easy way out – a way to keep my mind occupied on the world of teaching social studies and away from the fears that would otherwise occupy my mental space (certainly the set rhythms of the school week are a welcome contrast to the unsettling and unpredictable world of the NICU). My weekday now looks like this: After a restless night of sleep where I get up around 2:30am to help Megan get her supplies for pumping, I wake up at 6:00am: shower and grab my lunch, wake up Clio and get her breakfast, drop her off at daycare on my way to school. I teach and coach as I always have, though I now leave Cross Country practice earlier than I otherwise would prefer thanks to the invaluable compassion and understanding exhibited by Coaches Westphal, Kupres, and Snee – all of whom have picked up my slack over the past weeks. I arrive home and get updates from my wife, try to play for an hour or so with Clio, then do a few chores (wash the dishes, make lunch, get my clothes and coffee ready for the next day) before drawing Clio’s bath around 8:00. A few bedtime stories later, we lie her in her crib, and once she drifts off to sleep and our babysitter arrives, we make our now familiar 15 minute drive down Plainfield and County Line roads to Hinsdale Adventist Hospital, park, and take the elevator to the fourth floor where the labor and delivery rooms, maternity ward, and NICU are all located. Upon arrival, the first thing you do is wash your hands. We then walk to the southwest corner of the 1st of 3 rooms where Alexis and Beatrix lie in their incubators, tubes and IVs attached, developing in an environment that is the closest humans could come to simulating a womb. We greet the nurses, lift the blankets draped over the incubators to simulate night, and say hello to our girls. A typical visit includes an update from the nurse (or Doctor if he/she is there), helping with the ‘assessment’ (taking of temperature, changing of diaper, getting weighed) and giving the girls a swab with a little bit of mom’s milk. On a really good day, Megan will get to hold Alexis or Beatrix to her chest for an hour – a practice known in the NICU as kangaroo care, which research suggests improves the baby’s health and aids in mother-child bonding. On a tougher visit, alarms will sound almost continually, notifying the nurses that our babies aren’t getting enough oxygen, or had a dip in their heart rate, or are too cold. On one early visit, before I learned how to interpret these alarms, I broke into tears on my way out. I’d felt like I was in a war zone – that each alarm was a bomb going off, and after two hours of near constant beeps, my composure was shattered. I am always anxious when I arrive (as I was during the pregnancy phase, before every ultrasound), but usually now after a few minutes go by I begin to relax a bit more. While my emotional state these past few weeks has tended towards fear and worry for the health of Alexis and Beatrix, this has been substantially counterbalanced by feelings of gratitude: for the amazing amount of support we have been offered, for the good fortune of living close to the NICU, for the professionalism, expertise, and compassion of the nurses and Doctors who tend to Alexis and Beatrix. The girls have had their challenges. Both sustained infections during their second week of life; both still need help breathing. Alexis has had to get medication for her heart, while Beatrix has had trouble gaining weight. Two weeks after birth, both remain weeks away from weighing even two pounds. But, their vital signs are good, the nurses and doctors assure us their progress is typical for babies of their size, and every day that goes by brings good news, as it represents another day of growth and another day for their internal systems to develop. The Doctors do not – and, ethically cannot, make any guarantees. As we keep being reminded, ‘you are not out of the woods.’ My greatest fear remains that Alexis and Beatrix will not survive. I suppose, though, that this fear will never go away: not after we are discharged from the NICU, not after the girls are old enough to talk and walk, not after they begin school, nor even if they become responsible and successful adults with their own families. I know this because I know my parents continue to worry about me. I know from teaching for 15 years how much parents worry about their own children. And this is, of course, the reality of love. You cannot have love without fear and worry. So, here, the comparisons to Cross Country (indeed team sports in general) are apt. To be fully invested in something is to accept the hardship, frustrations, and disappointments that will invariably accompany any endeavor for which you are ‘all in’ (it is only the athletes who are NOT fully committed who avoid these challenges; but for them, glory will never be the prize). The greater you care about something, the more you expose yourself to hurt. But consider that equation in reverse. -This challenge has reinforced how incredibly fortunate and privileged I truly am. The question is not: why did this happen to us? It is rather: how is it possible we’ve been so fortunate to have both girls still living and with a chance to do well? Had this birth happened 30 years ago, it is doubtful either girl would be alive. If it had happened in many other places in the world, the same would be true. That we happen to live so close to excellent doctors and hospitals, that we are surrounded by people who have the means and desire to help us, that we have the insurance to cover what would otherwise be insurmountable costs – all of this is good fortune far beyond the norm. -NICU Doctors and nurses have the most important job in the world. Period. Sometimes as a teacher I am lauded for choosing education as a vocation. Teaching is important. Not as important as what my NICU nurses do. I once had a conversation with a man who argued that entrepreneurs were the drivers’ of America. I respect entrepreneurs. I don’t think they are more important than the people who work in the NICU. NICU workers tend to literally the most vulnerable humans in existence. They make entire lives possible. I never previously had any clue what a NICU looked like or what employees of the NICU do. I now understand how special a person you must be to choose to work in the NICU as your life’s’ work. -Health care is as much art as science. There is no prescription. Each individual, even identical twins, is different, and has unique needs. I’ve participated in conversations with Doctors as they’ve weighed the pros and cons of different treatment options. In the field of health care, people take a much more collaborative approach than in other professions. Our girls are seen by 6 main neonatologists who are in constant conversation with each other about what they are seeing and what they think the best way forward might be. Each of these Doctors has their own network of professionals who they are in communication with, bouncing ideas off each other and inquiring about different fields of research. They have the wisdom and experience to make educated decisions about what to do, but they can never be sure how these decisions will actually play out, since each one of us reacts differently. Thus, it is a constant feedback loop of trying out different treatments, adjusting, and finding the best path. Wean the oxygen a bit, and see how this impacts the heart rate. Too much weaning? Go back up. Readjust the tubing. Monitor weight. See how much the babies are urinating. Check their white blood cell count. All of these markers help the doctors assess the health of our babies and inform their decision on what to do next. I find this inspiring. I think it is a useful model to think about coaching. What if for each athlete we could create a network of professionals who were in constant communication about that athlete, charting a plan for them that is adjusted regularly based upon different metrics such as resting heart rate, hours of sleep, body temperature, and self-reports about physical and emotional well-being? It’s not really possible with 100 guys on the team, but if nothing else, this experience reminds me of the importance of seeing the whole athlete and consulting with others who might see the athlete in different contexts. -When you encounter true struggle for the first time, you learn that there are people you know who have depths of compassion that you never previously knew about. I have discovered that I have people in my life that I did not know as well as I thought. I never fully appreciated how amazing these people are. The kindness others have shown to my family is beyond any I’ve ever shared with others, and makes me want to do a better job of thinking beyond myself and not being shy about giving help to people when they need it, even when they are too tired or overwhelmed to ask. Relatedly, I’ve become more compassionate myself. I can see strengths in people I hadn’t previously recognized. Robert Callan is a senior on our Cross Country team. I have had both him and his twin sister Grace as students in my East Asian Studies course. Both were conscientious, polite, responsible and kind. Robert is not among our faster runners. His PR for the 1600 Sophomore year of track was 6:34. As a junior, he improved his time to 6:04. This year, our goal is to help him break 5:30. Here is the amazing part: Robert’s mother gave birth to him at 24 weeks and 3 days. He weighed barely over a pound. One of the biggest challenges premature babies face is lung-development. And yet, now Robert is training to be an Eagle Scout, headed to college next year, and a faster runner than 95% of his high school classmates (only a handful of non-Cross Country runners could plausibly claim to run faster). He and his sister are living miracles, and I never appreciated that until now. -Do your job well, honor your commitments, share your passion. Do this because it is a fulfilling way to live life. But a very unexpected and amazing consequence of living this way has been that during this past few weeks when my family has never had a greater need for support, we’ve discovered a huge network of people stepping in to lift us up and carry us through the challenges we’ve faced. So many people have been there for us – our immediate and extended families, my work colleagues, the families of current and former runners, friends from all different phases of our lives- sending well wishes, bringing food, caring for Clio while we visit the NICU. It has genuinely been awe-inspiring, humbling, and overwhelming to accept so much help from so many caring, kind, thoughtful individuals. To all of you, words are insufficient to express the depth of our gratitude. We who teach, who coach, who parent, who are students – all of us have benefited from the work and care of others. Every individual is unique and beautiful and has inherent value; but each of us as individuals cannot flourish without families, networks, teams and institutions designed to nurture us – each of those in their own way an incubator promoting growth. God willing, Alexis and Beatrix will grow up and eventually attend school at Hinsdale South. When they are old enough to understand, I hope I am able to convey to them how many different people are invested in their well-being and growth, how wide their network of support, how much we should be grateful for each new day. It is a lesson I am only now fully comprehending. I have received three major shocks in the past five months. The first shock came mid-April, when my wife Megan sat me down on the couch to show me her positive pregnancy test. This was joyous but unexpected news. It had taken us three years of trying, including rounds of fertility treatments, before we’d finally succeeded in having a baby together: Clio is now a precocious 19-month old. This time, I just learned, no such treatments would be necessary. Clio was going to have a younger sibling! Megan: Do you want to see the ultrasound? Noah: Oh, yeah. I didn’t know you got one. Noah: How’s Doctor Spencer doing? Megan: Well, she’s as excited as I am, because we’re having twins! Megan: Yeah (laughing). I’m not kidding. Megan: Yeah (laughing). Two babies! Noah: (Looking at ultrasounds) I suppose this was fate. You must understand something. I am a twin. My wife is a twin. We always joked that we were destined to be parents of twins, but in actuality the odds of twins having twins is infinitesimally small. This new revelation filled me with equal parts wonder and trepidation. We’re having twins! Will I ever sleep again?! I was soon to learn more information about our little ones: they are identical, and they are girls. I marveled to my wife that the contours of our life together were becoming clearer – I teach high schoolers, and at their age, the future is all hope and mystery. Can any 18-year-old truly know what their life will be like at 36 (or 37, my current age)? When we married, we knew we wanted a family, and now that dream seemed to be becoming a reality. So this is what life had in store for me: a job as a teacher and coach at Hinsdale Central, a home on a cul-de-sac in nearby Willowbrook, a loving wife, and three adoring daughters. No doubt my 18-year old self would be pleased with this outcome. Then came the third shock. Identical twins, we were informed, carry higher risks than more conventional pregnancies. Unlike most expectant moms, Megan was instructed to schedule more frequent ultrasounds, just so that the Doctors could keep a closer eye on the twins’ development. At our week 16 checkup, (Thursday, June 22nd), our Doctor came in to review the ultrasound and delicately told us that they’d noticed an abnormality: one twin was growing faster than the other. A few other data points from the ultrasound readouts concerned them. We were told it may be possible that what they were seeing were early signs of a troubling development known as ‘Twin to Twin Transfusion Syndrome’ (TTTS). A relatively new surgery (developed within the past 20 years) to treat this affliction is the best hope for addressing the problem (a shunting off of blood from one baby to the other) though success rates hovered in the 70% range. We were told to return on Monday – if the symptoms worsened, we would need to make immediate plans to fly to Houston where some of the nation’s best maternal-fetal specialists work. We exited the hospital in a daze. I put my arm around Megan and whispered to her, “life has just thrown us a curve ball.” She made it to the car before the tears came. We sat together in our sun-baked Honda Civic in the middle of a busy hospital parking lot, Megan sobbing and me staring into space (my own tears would come later that day, as we lay together on our bed watching a video about TTTS sent to us by our Doctors). Monday, June 26th, the day of our 7th wedding anniversary, began for me as most summer Monday’s usually do – with a long run around Waterfall Glen. I was grateful for the tranquility such a run provides, using it to calm my nerves. Practice over, I hurried home, showered off, and exchanged pleasantries with the babysitter before getting into the car with Megan for the drive to our clinic in Glen Ellyn. We spent the car ride discussing possibilities and reviewing questions we had for our Doctors. I felt something equivalent to pre-race jitters as we entered the doctor’s office and waited to be called back to the examining room. This time, I was more mentally prepared for the unexpected. The past few days had been tough, as we’d had to make many of the phone calls no one wants to make and hustled to put into place plans in the event we’d need to be flown to a hospital out of state. The interregnum had allowed time for Megan and I to process what we’d been told, to research treatment options and outcomes, and to vent emotionally. We were better positioned to learn what the fates foretold. Which was this: it appears the condition of the twins was not, in fact, TTTS, but rather a different but related condition called ‘Selective Intrauterine Growth Restriction’ (SIUGR). Since I am not a doctor, I will refer to the Children’s Hospital of Philadelphia’s website to explain: “Selective intrauterine growth restriction (SIUGR) occurs when there is unequal placental sharing which leads to suboptimal growth of one twin.” SIUGR evidently occurs in about 10% of identical twin pregnancies. It can range in severity, with the worst cases resulting in the death of one fetus in utero while the best outcome to be hoped for is a birth of two babies at 34-35 weeks. Unlike TTTS there is no treatment. We must simply watch and wait. Subsequent appointments have confirmed this diagnosis. On our most recent visit, at 18 weeks, we learned one of our babies weighs about 7 ounces and the other 5. Encouragingly, the smaller baby seems to be receiving appropriate blood flow and is growing, albeit not as quickly as her sister. We have to hope she continues to grow and gets far enough along to be safely delivered. If we can make it to 28 weeks, our odds improve. If we get to 32, we are looking better still. For the runner and the coach, exercising control over as many variables as possible is the most valuable currency we have. Yet, here Megan and I find ourselves in a situation where we have no control. It is a truly humbling experience, a reminder that free will is, to some degree, mere illusion. There are forces shaping us, in utero and out, that we have no power to impact. For once, there is no running or coaching analogue. Hard work and determination are irrelevant to this particular situation. Chance rules. I often use the metaphor of the unfinished book when discussing an upcoming season with my team. Some chapters have already been written, I tell them, but you guys get to help write the conclusion. In the coming months, the narrative of our teams’ season will parallel the narrative of Megan’s pregnancy. I’ll have some power to shape one outcome, but none to shape the other. In both cases, by mid-November, the stories will likely both have officially been told. At this time, when the ending is not yet known, I hope to live each day with gratitude: for Megan, who carries our babies and who, through the sheer force of her love would will them to health and safety, if such a thing were possible; for the doctors and nurses who have exhibited expertise, compassion and honesty in helping us understand our situation; for our family, friends, and colleagues who have formed for us a network of support that has made this episode so much more bearable; for having good health insurance(! ); for the guys on my team who inspire me daily with their youthful enthusiasm and sense of purpose; and for little Clio, who reminds Megan and me always that no matter what happens, we can never say life has cheated us, and whose smile and laugh brighten even the darkest days. The oldest and purest athletic completion of all is the simple foot race. Our sport, Track and Field, has its origins dating from even before the original Greek Olympiad. All kids run. Running fast is fun. Jumping far or high is fun. Throwing something heavy as far as you can is fun. Haven’t you ever taken a rock and thrown it as far into a lake as you can? Leaped off the top of a sand dune? Raced your friend to the end of the block? The building blocks of Track and Field are written into our DNA. Humans were never meant to be sedentary. Track and Field is a sport that harnesses the skills needed for every other sport: speed, strength, endurance, and coordination. There is nothing arbitrary about who wins the race. Matt McBrien (class of 2015) barely outkicks a competitor from Lane Tech during his Sophomore year at the Hinsdale Relays. He would go on to be part of two state champion Cross Country teams and is now a member of the Cross Country and Track Teams at Georgia Tech University. No judgement call from the ref will determine the outcome. Same goes for all the other events – it’s easy to see who jumps over the bar and who doesn’t, who throws or jumps the furthest. In soccer, football, baseball, hockey it is plausible that the team that plays better can still lose. Sometimes it comes down to a judgement call, a penalty called or not called (ask the Fenwick Football Team). In Track, the results are there for all to see. Irwin Loud of Oak Park-River Forest and Blake Evertsen of Hinsdale Central battle it out down the final straightaway at the 2016 Indoor Conference Championships. Loud would best Evertsen on this particular occasion by .07 seconds. The two elite distance runners have established a fearsome but respectful rivalry since their freshman year. You don’t need much to succeed in Track. You don’t even need a Track. There is one regulation Track in all of Ethiopia, a nation whose distance runners have won dozens of Olympic medals over the past two decades. Cahokia, the best Track team in our state, has no indoor facilities. Some sports, even swimming, are largely restricted to wealthier parts of the world. Anyone can do Track. You need very little equipment. A pair of trainers and a pair of spikes. That’s it. If you can’t afford those, we’ll help. You don’t need to have started on your training as a little kid to be successful, as you might have in tennis, golf, swimming or wrestling. Your talent is already there- our goal as coaches is simply to help you find and develop it. Let me give you an example on athlete who had talent but needed help finding it. Last year, I stopped a young man in the hallway just like I stopped you. His name was Justin Taylor. Another teacher had seen him shooting some hoops in the gym and was amazed at his hops, so told me about him. I waited just outside of his 10th period Social Studies class and when he was about to enter I made my pitch. Justin did not initially want to join Track. He was polite but shy, and I feared he would demur and pass on my invitation. The first day of practice went by, and he was not there. On the second morning of practice, Justin walked in about 15 minutes after we’d started. I walked over to him, smiled, and told him how glad I was he decided to try it out. I walked him over to our high jump Coach Andy Antoniou, introduced him, and we tested his vertical. It was pretty good! Coach Antoniou is a great coach. He took Justin, a kid who’d never tried the high jump before, and by the indoor conference meet, Justin had leaped 5’4”. Then, after a few more months training, he cleared 5’7” at our outdoor conference Championships in mid-May, finishing third overall at the Sophomore level. I was so proud of him. As he improved, his confidence grew. I saw him come out of his shell a bit, walk a little taller. This year he will enter as a major asset for our team, no longer reluctant to join, but proud to be a part. We want that for you, too. I literally stopped Justin Taylor in the hallway to ask him to consider coming out for Track. Less than half a year after that conversation he finished third at the Conference championships. Young man, one advantage of Track is we can neatly chart your progress. We won’t have to guess if you are improving. We can measure objectively. We know Justin became a better high jumper by May than he was in January. Pick some events. We’ll see what marks you achieve in your first few attempts. We’ll see what marks you get after weeks of practice. Then, where you are towards the end of your first season. And, if we are fortunate, we’ll see where you finish as a senior as compared to when you first started. It is my coaching imperative to help you improve. If you are willing to work at it, I am confident you will. Technology is better now, but back in 2013 I literally used graph paper and pen to chart out the four year progression of all our distance runners in the 1600. One thing I love about Track is that every guy can have the chance to earn recognition because every guy can improve. You might not be our fastest guy, but if you work hard and get faster, we’ll be thrilled for you. In reality, the vast majority of guys who join our team won’t break any school records or be on any national lists, but the goal is the same for all of us: to get better. There is something truly rewarding to know that you are capable today of something you were not capable of previously. We in Track call that setting a “PR” (Personal Record). And we celebrate every time a guy on the team sets one. Jeff returns this year as one of our top throwers, and for his senior he’ll be coached by a former Olympian, as Tom Putskys, America’s best Javelin thrower for most of the 1990s and 2000s joins our staff. Under Coach Putskys’ guidance, I am confident we’ll have many more PRs this season to celebrate with Jeff. Another guy who joined our Track team for the first time later in his career was Steven Coan, who came out last season for his senior year. He’d played club soccer for his first three springs but since his soccer career had ended and he had friends on the team, he decided to try Track. It took some time to figure out where he would best fit, but through trial and error, we learned he was a pretty darn good 400 meter runner. Steven Coan (class of 2016) kicks down the final straightaway of 400 meter race at Outdoor Conference where he finished a surprising 3rd. Coan played soccer all through high school before joining us as a senior. He made incredible progress in his short time with us. My wife and I just sent our Christmas Cards. We ordered 100. About half went to family, the rest to friends. Of those friends, a significant majority are former high school and college teammates (others are families of kids I coach – see #4). Last month I flew to Seattle to visit college teammates – one lives there, one in Minneapolis, one in San Francisco. We haven’t been on a team together since 2002, but we’ve managed to see each other 2-3 times a year since then, such is the strength of the bond we created. John Marinier is our hurdles coach. In 1998, he and I were teammates at York. John was a star soccer player and also a 3-time all-state Track athlete. Our senior year he finished 4th in the 300 Intermediate Hurdles (.001 from 3rd) and was on the state runner-up 4*400. We finished 2nd in state as a team that year. He and I have the shared vision of improving upon that finish now that we are coaching together. When we first became friends, we were 11 years old, both 6th graders on the Brian Middle School Cross Country team. Now, we are 36, each with 1-year old daughters. That’s a quarter-century of friendship, begun of being teammates and sealed through the bond of high school athletics. Two other coaches on our staff, Coach Westhphal and Kupres, became friends when they were college teammates at Loyola. They stood in each other’s weddings and remain close today. While Track is sometimes called an individual sport in the sense we are all trying to improve upon our own best performances, at this school we will emphasize TEAM most of all. I want you to see other kids walking through the halls wearing our “HC Track” shirts and know that those guys are your natural allies. Then Freshman (now Sophomore) Robert Banda getting mentally prepared for his events. Banda broke our freshman indoor record in the Triple Jump last season with a mark of 38’1″. He is wearing the trademark “HC Track” shirt with a new logo that my wife, who is a graphic designer, created for our team. I want any team victory we might be fortunate enough to earn to feel like it was earned by all of us, and celebrated as such. There is no better feeling than celebrating TOGETHER. Why did 5 million people feel the same impulse to get to Chicago, despite all the inconvenience they knew they’d face, to be there for the parade celebrating the World Series champion Cubs? It is because they wanted to feel like they were a part of something amazing. That is what I want for you, young man – to help you authentically earn that feeling. HC has not won Varsity Conference since 2002, and has done so only once since WWII. That is our goal for this year. Come join us! There is no guarantee we will achieve the goal, but we never will if we don’t try. And if we succeed, many what an amazing feeling that will be! Charlie Gelman (foreground) and Ben Schnieders (background, with his famous hair) are two of the best ‘team guys’ I’ve ever had the privilege of coaching. Here they are in the bleachers of York’s field house rooting hard for their teammates at the Indoor conference meet last season. We did not win, but we did improve more than any other team in our conference from the previous year. As your coach, I will form a stronger bond with you than I would if I were only your teacher. I know I am not supposed to say that, as I was once told by an administrator that I am to be a “teacher first, coach second” (I don’t think those roles can be separated). The truth is that I teach one-semester Sophomore elective courses. I get to know my students for half a year, then they move on. If you come out for Track as a freshman, though, we will have four years to get to know each other. I will invest heavily in our relationship, will strive to help you realize your true potential and to achieve feats you don’t currently think you are capable of. Track isn’t like soccer, football or baseball. We aren’t split up by grade level. You won’t have a different coach as a Sophomore than you did as a Freshman, with yet another Coach assigned when you move to Varsity. We’ll be your coaches all four years. This past November, York High School held a retirement celebration for the legendary Cross Country and Track Coach Joe Newton. I had the opportunity to give thanks to Mr. Newton for all he has taught me. I hope I can come close to being as positive a mentor for young people as he was for me and the literally thousands of other athletes he coached. I have tried to live out his words. Just last week I was contacted by an athlete who I had not heard from in five years. This athlete did not run all four years for us – he stopped after his junior year to focus on academics. He will be graduating this spring from UPenn and is applying to join the Air Force, so he wrote to ask me for a letter of recommendation. I wrote the very best letter I could. No matter how long its been since you graduated, I will ever remain your steadfast supporter and champion. I keep a file folder of every positive note I get from a student, teacher, or athlete. It is a small reminder to myself that there is value to what we do in athletics beyond the meet results. I am going to share some of these notes with you, not because I am bragging, but because I want you to understand the depth of the bond that is created through years of working hard together towards common goals. This very afternoon, Billy and I are getting together to go for a run. We’ll discus his new job, his family, running, coaching, politics, and any other topic that comes up. I love winter break because it gives me time to catch up with so many of my former athletes. Our relationships last far beyond the four years you’ll spend in high school. Coach Lawrence has taught me many lessons about having a true passion for what you do, very hard work, and loyalty to your teammates. A sport that I barely liked freshman year, I have come to love, and I can honestly say Coach Lawrence has played a huge role in igniting that flame…I can honestly say I have grown from a football player who just did track to get faster, to a runner who loves his team and his sport. I hope that one day I can inspire young men to love something and work at it the way he does. That first day, when I walked into the health room where we would hold our daily team meetings, I introduced myself to Coach Lawrence; he immediately responded with a determined smile and welcoming body language. He didn’t look at my bigger body-type and my freshman-sized stature condescendingly. Rather, he saw within me the potential to be a great runner, hard-working athlete, and even more, a mature young man. This is a perfect example of Coach Lawrence’s genuine care not just for the top 12 runners, but for EVERYONE on the team. Some coaches in other sports programs will only care for and nurture his most valuable athletes, and naturally so. But Coach Lawrence doesn’t settle for a few great runners. He wants everyone to revel in the joys of success, personal records, and improvement…Coach has showed a genuine compassion for all athletic levels and he has made our team culture one of hard work and dedication. That first time trial my freshman year in cross country, I ran a 9:29 for the mile because I couldn’t even run the second mile, and since then, with the guidance of Coach, I have improved immensely to a PR of 5:18. Thank you Coach Lawrence for being a great mentor. I will never be able to repay you for teaching me so many life lessons. You have personally made a huge impact on my life and for that I am forever grateful. Hi Coaches. Now that Alex is about to graduate, we have been thinking a lot lately about how thankful we are about the 4 years he has spent at Central. Attending Central ended up being a wonderful experience for him, and for his parents. He has done well academically, in sports and made great friends. Hard to beat that. But maybe most importantly, he was mentored early and often by influential teachers and coaches. The role that you guys have played in Alex’s development as his track and XC coaches, as teachers and for being an overall positive influence cannot be underestimated. Please accept our sincerest gratitude for all that you have done to help shape Alex into the man he is today, and to prepare him for life after Central. I saw Alex at a team reunion last summer. He is enrolled at Chiropractic College at National University in Lombard, an institution my own father used to teach at. We hadn’t spoken for years, but upon seeing him again I was immediately taken back in memory to 2008 when he and his teammates, a fun-loving bunch to be sure, became our first group to qualify for the IHSA Cross Country Championships as a team. I am honored to have played some role in Alex’s development, and hope to do the same for you. You can be Prince Fielder and still excel in baseball, or BJ Raji and still be a solid football player. Track athletes are some of the fittest athletes you’ll ever see. Ever see any Track and Field Olympic medalists (non-throwers) with these body types ? There are a lot of unhealthy behaviors high school students engage in: drug and alcohol use most obviously, but also poor sleep schedules, bad nutrition habits, irregular schedules. Track can be an anchor. It helps you organize your day, and allows you to get in your daily exercise, helping you to feel good about yourself. Studies show that your environment shapes your individual choices. If most people around you smoke, you are far likelier to start smoking. So why not surround yourself with people who are really in shape, striving to get even fitter? Our goal is to create a supportive and healthy environment to help you flourish. …but I realized that with other people behind you, you can tackle almost anything. Skipping out on the track season my senior year was probably one of the worst mistakes I have made ever. On the team, each and every single guy had my back…At the time it felt like the cool thing to do, that I…was going to go out and live my life and escape the long runs and escalations that had been making my life hell. I can honestly say that the extra semester of sleeping in on weekends, and going home right after school was not worth it at all. Now especially, I am realizing that you are who you are because of the people you surround yourself with. And when I was surrounded by runners, I was a runner. I share Mark’s words with his permission, as he wrote to me that he hopes others will not follow his lead. I am happy to say that Mark is now a senior at Marquette University and will be graduating this spring. Our relationship remains as strong as ever. Even if you quit while in high school, I will respect you for at least trying out. Let’s talk about race. It’s a subject that makes people uncomfortable. I teach African American History. I am white. This is an issue we need to be more open about. Diversity is a strength. Diversity also takes hard work. By definition, diversity means you have people with different backgrounds, experiences, and values, which means tension is almost inevitable. One reason I love Track is that every year we have one of the most diverse teams. In part, this is because our team is large. In part, it is because there are so many different events to choose from, and we feed from many different sports. What unifies people? A common goal is a positive unifying force. Joining track will allow you to join with other boys your age who may be different than you in many respects. We can at least start to get to know each other on the basis of equality by our shared commitment to the goal of winning Conference. Top from Left: All-State Pole Vaulter Steven Chun (class of 2015), Hurdler Shawn Zhou (class of 2016), sprinter Trent Riggins-Walker (class of 2019). Bottom from Left: all-state 3200 runner Blake Evertsen competing here against eventual Footlocker Midwest Cross Country Champion Danny Kilrea of Lyons Township, Hinsdale South’s 1:53 800 guy Brian Jordan running against Andrew Irvine (class of 2016) at last year’s Sectional 4*800, school record holder Nick Piker (class of 2013) hurling the discus. Now I am not naive. I don’t think mere participation on a Track Team will salve the nations’ racial wounds. But Track and Field has been a venue of greater equality than many other realms in American life and culture. In a Track race, unlike life, everyone begins on the same starting line. We all know the story of Jessie Owens’ heroics in the 1936 ‘Hitler Olympics’ where he disproved with his foot speed the lie at the heart of Nazi ideology. Somewhat less well-known is the courage displayed by African American sprinters Tommie Smith and John Carlos at the 1968 Mexico City Olympics when both raised a fist in the black power salute while on the victory podium for their gold and bronze medals in the 200 meter dash. Smith and Carlos hoped to draw attention to the fact that they were running for a nation which treated them as second-class citizens, and they faced intense criticism (were black-listed for jobs, too) for their actions. This was 1968, a year even more tense than 2016, when America really was on the verge of tearing apart. In a rare display of contrition, the USOC actually invited Smith and Carlos to join the current Olympians on their visit to the White House this past September, showing recognition at long last that their protests were, in fact, patriotic, and not anti-American as many argued at the time. It frustrates me how many of my students have formulated opinions about a more recent controversial figure, Colin Kapernick, without ever knowing anything about Smith and Carlos. On the Track team, we will teach you our sport’s history, one in which African Americans have played a prominent role, from Owens, Smith, and Carlos to Bob Beamon, Carl Lewis, and Alyson Felix. Track is a sort of utopia in that it really is true that people won’t be judged on the color of their skin, but rather the results from their event – it is the ultimate meritocracy. People will respect you for your achievements, no matter what other misconceptions or unfair judgments they might make of you. And that ain’t much, but it is something. Well, young man, thanks for hearing me out. I hope you’ll join us. The season starts January 23rd, and we’ll be meeting in the Dance Studio at 3:15. It you’d like to learn more, take a look at our website: www.hctrack.org or come see me in room 282. I hope to see you on the big red oval!